This wildlife and jaguar holiday in Brazil offers you a very high chance of seeing jaguar (100% success rate in 2018, as well as 2017, 2016 and 2015) the most elusive big cat in the world, together with some of the world's least-known and most exotic wildlife in a vast wildlife reserve in the heart of the continent. The Pantanal is the Serengeti of South America, over 58,000 square miles in total, and home to many wild animals and birds, yet still with relatively few tourists. It's where the BBC and Discovery Channel go to film their documentaries. Along with jaguars you will see otters as big as a man, giant capybara, hundreds of South American alligators (caiman), Brazilian ostriches (rhea), and giant anteaters. You'll also be taking in Rio de Janeiro, the Atlantic rainforest, and the world-famous Iguaçu Falls. As this is a Tell Tale trip, you'll spend time with expert guides and meet local people – you are guaranteed the inside track on Brazil. But this not just a Tell Tale trip, it's the ultimate Tell Tale trip! We may be nice people who do special experience holidays for nice people, but... this trip is Tell Tale, predator-style. Please note this trip must be taken between June and November and booked well ahead. As recommended in the Sunday Times Travel Magazine, as well as in Wanderlust magazine (as a top 10 wildlife adventure). The first stop of this private tour of Brazil is Rio de Janeiro. You'll be staying within a 19th Century 'chateau', in the hills of Rio. Fantastic views and friendly hosts. You'll be whisked around Rio's natural attractions – the huge rainforest national park, replete with rare birds and dripping with waterfalls, and the Morro de Urca and Sugar Loaf mountains where the world's tiniest monkeys still scurry through the trees. You'll also have time to visit Rio's famous beaches if you wish. Now it's time for the big cats. You'll fly from Rio to the Pantanal in the heart of Brazil. This vast area of seasonally flooded wetlands and open savannahs is overflowing with wildlife. You will divide your time between ranches/lodges and a 'jaguar camp', ideally placed for the best chances to see jaguar in the wild. Working with locals who've been tracking jaguar since childhood and are expert guides who work with Panthera, we've had 100% success rate in recent years. "We booked this trip to experience an incredible country and see amazing wildlife; we did just that... we feel that we have been given a glimpse into a part of the world that many people will never experience and for that we are very fortunate. Then it's onto Iguaçu Falls – one of the great natural wonders of our planet. The waterfalls here – 275 in total, stretching 2.7km – are almost twice the width of Victoria Falls in Zimbabwe, and two-and-a-half times the width of Niagara. As the river thunders into the "Devil's Throat" with a defeaning roar and you are enveloped in a billowing cloud of mist, you can't fail to make memories that will last forever. The falls sit on the border of Argentina and Brazil, in a huge rainforest national park filled with wildlife including capuchin monkeys, coatimundis, and electric blue Morpho butterflies as big as your hand. You will visit both sides of the falls to get the full experience (though please bear in mind that the falls are popular, so this part of your trip is somewhat less off-the-beaten-track than the rest). Jaguars and Waterfalls is a private tour for two (or more) which can be taken between June and November (subject to availability, we recommend booking ahead). If you are a solo traveller, have a look at special small group departure. Friday or Saturday Day 1: Fly overnight (approx. 9pm departure from Heathrow) with LATAM airlines from London Heathrow, changing planes at Sao Paulo in the morning. Or you can fly direct with British Airways direct from Heathrow to Rio, in which case you will need to fly at lunchtime, arriving in Rio late on the same day (Brazil is 3-4 hours behind the UK). If flying BA, we are also able to arrange connecting flights from UK regional airports. Day 2 D (dinner included): You'll be met at the airport in Rio de Janeiro and driven into central Rio and into the hills of this city in Santa Teresa. You'll be staying in a 19th century private home with stunning views, where you will you get the inside track into life in Brazil, meeting 'real local people', an essential part of a Tell Tale trip. You'll have time to settle in. Later your driver will be back to take you to visit one of Rio's famous beaches or perhaps the Botanical Gardens to see hundreds of orchids, Amazonian water lilies and sloths and brown capuchin monkeys in the trees. You'll spend the evening with your hosts, Luiz and his wife Rejane, you'll have dinner at home or go out for a cultural experience (depending on the day). Day 3 B: Today you will be taken around Rio's highlights including a ride to Corcovado to see the Christ statue and Sugar Loaf mountain. This evening, your driver will take you into the city to have dinner at one of Rio's bustling restaurants, choose from the tips in your Tell Tale pack. Day 4 L: Today, you'll visit a special sanctuary in the Atlantic coastal rainforest. Regua is an important place to support, it is one of the world's biodiversity hotspots. Many birds are only here. They are among the world's most beautiful. You will hopefully see toucans and brilliantly coloured tanagers, trogons with tails like a bird of paradise and darting emerald green hummingbirds. And with luck you might see the largest monkey in the Americas, the critically-endangered southern woolly spider monkey. Day 5 B D: Time to move on. You'll be driven to the airport for an internal flight to Cuiabá in the Pantanal (changing planes at a hub airport such as Sao Paulo or Brazil's capital Brasilia). You will be met at Cuiabá airport and driven into the Pantanal, on the Transpantaneira. You will see plenty of wildlife along the way, capybara crossing the road, metre long parrots flying overhead, eagles on fence posts. You will arrive at Pouso Alegre fazenda (ranch house), set in 8,000 hectares and surrounded by two private marshy lakes. It is rustic but it's a good first stop for some of the best wildlife-watching opportunities around. Time to settle into your room and see what you can spot in the grounds. This evening, you will have your first dinner in the Pantanal, with the sounds of the jungle as your backdrop. Between Days 5 to 11, you may be joined with (a small number) of others on transfers/wildlife activities/boats. If you'd like all elements guaranteed exclusively for you, please see the supplements section. Day 6 B L D: Early this morning you will have a walking safari with your guide (who will be with you until the end of Day 11). This area is known for lakes filled with caiman, huge flocks of parakeets and Marsh deer - which are unique in having webbed feet. You'll have a break and dinner. Then it's time for a night safari, watch out for those eyes in the night..they may well be caiman. Day 7 B L D: Time to pack up and be driven further into the heart of the Pantanal, Porto Jofre and where you'll arrive at the Pantanal Jaguar Camp. You're more or less right in the middle of the continent! This part of the Pantanal has the highest density of jaguars in the world. 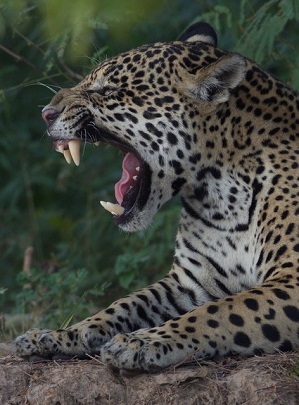 Staying right here combined with our expert guides/trackers will make sure you have the best chance of spotting jaguar. Don't expect luxury in such a remote area of Brazil, but you'll be comfortable enough in your room with en suite facilities and air conditioning (though please bear in mind the electricity is powered by solar and a generator). You'll have your first boat trip this afternoon. Responsible tourism certainly contributes to the conservation of the jaguars. Enjoy a dinner of authentic Brazilian fare, before bedding down for the night. Day 8 B L D: Morning boat trip and jaguar safari in the Pantanal, and again in the afternoon. A particular favourite sight is families of giant river otters (we could watch them for hours! ), although other highlights have included birds of prey feasting on their catch and a capybara floating down the river on a makeshift raft. Day 9 B L D: Another day of boating to maximise the chances of seeing jaguar, as well as other animals. Day 10 B L D: Pack up and head off to Pousada Rio Claro, a comfortable fazenda. Explore the diverse deciduous and non-deciduous forest and savannah, with lots of wildlife, before a night safari. Day 11 B L: Early morning canoe trip at the lodge followed by horseriding (the horses are easy to ride here, or you can go for a walk with your guide if you prefer). Panteneiro cowboys are descendants of Portuguese who mingled with Brazil's native Indians and live their lives in a 200-year tradition farming the special breed of Pantaneiro cattle which are unique to this area. Transfer to Cuiabá for a night in a hotel before your onward journey. Day 12 B: Fly from Cuiabá to Iguaçu Falls (again, you'll need to change planes) where you will be met at the airport. A short transfer to your hotel and time to have a dip in the pool. Day 13 B: Your private guide will take you around the majestic Iguaçu falls on the Argentinian side. On arrival you'll board a train which takes you right to the fantastically-named Devil's Throat. Here the smooth river turns into a seething torrent as it thunders over the horseshoe-shaped precipice on to the rocks 74 metres below. The Argentinian side of the falls is set in jungle, so there are lots of plants to see wildlife-spotting opportunities. However, our favourite encounter is at the falls themselves, where countless great dusky swifts dart in and out of the cascades (see Fred Barrington's fantastic photo, right – click to enlarge). If you want to get really close to the falls, you can opt on the day to take a boat trip, but be warned – you will get soaked! Day 14 B: Your private guide will take you to the Brazilian side of Iguaçu, where it's all about the view. You won't be as close to the falls today – all the better for taking those panoramic shots – but there is a walkway which makes you feel like you are at the very edge. You'll also visit a fantastic aviary where you'll see the world's largest parrots, toucans, and scores of other South American tropical birds, some of which are rare or nearly extinct. Footage of Iguaçu Falls taken with a drone. Day 15 B: Morning at leisure (dependent on flight timings) and short transfer to Foz do Iguaçu airport for a flight to Sao Paulo or Rio de Janeiro airport, connecting to yourflight back to London Heathrow. (You and your luggage will be checked through from Iguaçu to London). Day 16: Arrive at London Heathrow This will be a Saturday if you departed on a Friday. This private tour based on two people sharing costs from £4,795 per person. The tour price includes international flights from London Heathrow with LATAM, all flights within Brazil, private transfers, accommodation, wildlife guides in the Pantanal, activities/excursions and meals mentioned. Excludes entrance fees on Days 2 and 3. Entrance fees are included for other activities including tickets and train at Iguacu waterfalls (optional boat ride to be paid locally). You can also book this tour excluding international flights for £3,895 per person. Your tour would start in Rio de Janeiro and end at Foz do Iguaçu airport. Note your tour would exclude the flight out of Foz do Iguaçu. This trip can only be taken during June to November. Early booking is advised. It is definitely possible to travel at the 'from' price! We recommend booking as early as possible, both for pricing and availability. Flying with British Airways economy class on the international flights is usually an extra £200pp (difference in flight costs and extra night's accommodation on Day 1), although sometimes there are special fares, ask us to check. British Airways regional add ons, ask us to check availability and price. To date, we've made arrangements from Manchester, Edinburgh and Jersey. British Airways premium economy or business class, ask us to check. Please note if you are flying British Airways, seats can only be selected with no extra cost 24 hours before flying (during online check in). All elements in the Pantanal, including transfers, wildlife activities and boat trips to be guaranteed as private just for you, usually £1,100pp. Main image of jaguar by Roger Day; Jaguar drinking by Roger Day; Hawk by Marjorie Socha; Jabiru stork, Anteater; Jaguar mother and cubs by Fred Barrington, and jaguar in the grass by John Tomsett. (click here to see all of John's photos in full size).